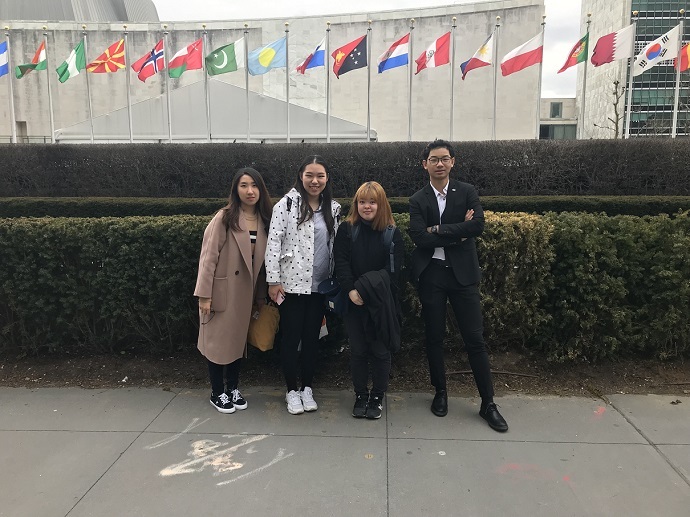 English Language Institute students visited the United Nations. From left are Junhui (Carol) Yang, Mengyao (Wendy) Wang, Miwa Mashiko and Haohui (Nate) Pan. Five English Language Institute (ELI) students were among the winners of the Pan Global Challenge, a project sponsored by Blackstone LaunchPad to address the issues of cultural and language barriers between domestic and international students. Students were asked to develop innovative solutions that could be products, services or technologies that lead to better global communication. ELI students Junhui (Carol) Yang and Haohui (Nate) Pan won first place for proposing that students receive academic credit for joining and participating in Syracuse University clubs and organizations. 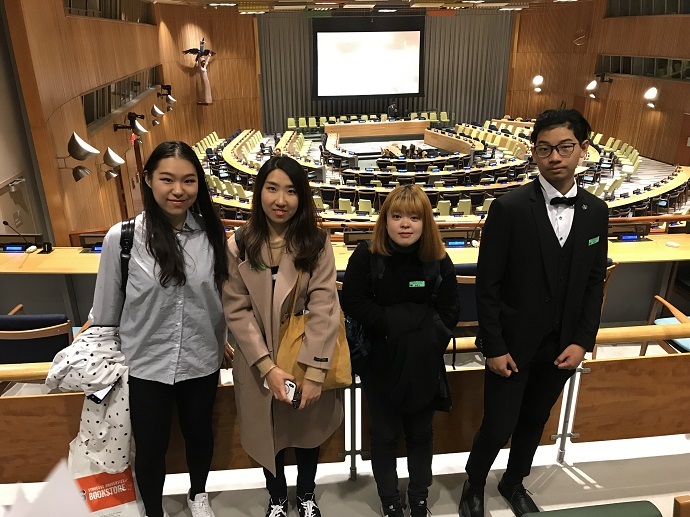 First place students received a monetary award and several winning ELI students traveled to New York City in March for a tour of the United Nations. English Language Institute students visited the United Nations where they took a tour. From left are students Mengyao (Wendy) Wang; Junhui (Carol) Yang, Miwa Mashiko and Haohui (Nate) Pan. The students also had the opportunity to view the art collection. Each country is allowed to bestow one gift to the United Nations. The collection represents a diversity of cultures and periods in history. “Gifts included a Peace Bell from Japan, a Buddha statue from Thailand and artwork representing significant and historical events that took place throughout the world,” explains Pan. The English Language Institute (ELI) provides intensive English instruction to international students and visiting professionals at all proficiency levels.